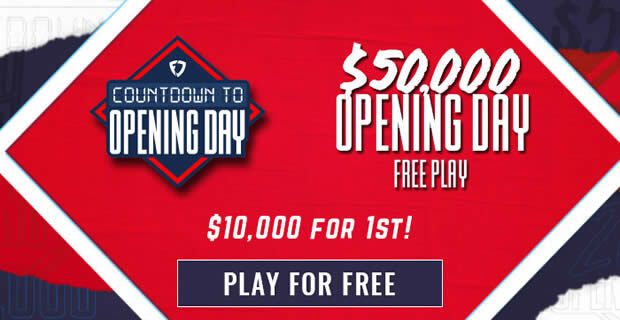 With the start of baseball spring training comes preparing for fantasy baseball pools and, more importantly, your chance to win money in your fantasy baseball leagues. Our Fantasy Baseball Strategy Guide (below) offers top strategies that will help you to win your Rotisserie Baseball Leagues or Fantasy Player Pools. These great tips will help you dominate the fantasy owners in your daily, weekly, monthly or full season leagues. For daily fantasy baseball leagues including top sites to play at for real money, please refer to our Fantasy Baseball Leagues section. If you are interested in tips for daily fantasy baseball games, check out our Daily Fantasy Baseball Strategies. 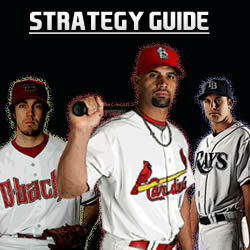 Below is our list of fantasy baseball strategies to help you win your pool or league. When your baseball fantasy pool league rules are sent out, don’t ignore them; study them! Inside your league rules are many answers to how you can beat the rest of your league. Know the salary caps in your league, how many players need to be taken and how many at each position. Know your league rules on waiver wire pick-ups; how many a week, a season, when during the week, first come first serve, or in order of standings. You need to know about trades; how many, what is the deadline. Most importantly, you need to understand the scoring structure of your baseball fantasy league. Are hitters more valuable than pitchers? Is the fifth category runs or slugging? Do holds count for pitchers? Are there minimums for total innings pitched? Understanding your rules is a vital first step in winning your fantasy baseball league and making you some real money. In every baseball fantasy league pool, players drop out or enter in. There are 8 team leagues, 10 team leagues, 12 team leagues and even 15 teams leagues. Try to get the commissioner of your league to nail down a number as soon as possible because this will eliminate wasted time in ranking unnecessary players. In a 12 team league that typically has 5 outfielders, at least 60 outfielders will be drafted. With utility players and a taxi squad that number increases. So, a safe bet for a 12 team baseball pool would be 75 outfielders in total ranked. There are 30 major league baseball teams with 3 starting outfielders each and then usually a fourth or fifth outfielder. When looking at rankings, you need to focus on the top three per team and then rank them accordingly. You need to rank who you think are the top 75 outfielders so that on draft day if a name pops up that is not on your list, you can do a quick scan to see who he is but if he’s not in your list of 75, you can move on and prepare for the next player. Undoubtedly someone in your pool will nominate a fourth outfielder that won’t help you win your baseball league. Do this for every category; for smaller positions such as catcher or first base you adjust the number of players ranked accordingly. By knowing how many players will be picked on draft day, you can eliminate useless studying on players that won’t even be drafted. Think that is a myth that players have career years just before contract time? It happens...and it happens a lot more than you think. I don’t suggest drafting a team of impending free agents, but it is a nice tool to have when trying to decide which 4th or 5th pitcher to bid on next. On the flipside, be leery of players who have just signed their big baseball contract. Again, you hear it all the time that production lowers after they have signed a huge contract because they are just not fully motivated. Sometimes the effect of a new team or new league (more on that later) can reduce production as well. There used to be a saying: "If I had every hitter on my team hit 15 homeruns, drive in 80 RBIs, steal me 15 bases and hit .280...I would never lose!" Obviously you must know which 5 categories are most valued to your league (again know your league rules) as usually the 5th category is either Runs or Slugging Percentage. Being number one in Home Runs and RBIs and last in Runs scored and Stolen Bases still puts you in the middle of the pack. Now if you sprinkle your lineup with a couple of the best 5 tool players, you at least reach the top third of your league in hitting. If you are in a 12 team league, you may already be in the money if you finish in the top three. For example, having Mike Cameron every year on your team works because although his .269 batting average hurts, he usually has 25HR, 80 RBIs and 25 steals with about 80-90 runs scored. Derek Jeter is the same kind of player who just seems to have similar numbers every year that don’t "Wow" you in fantasy circles, but are the essential key to winning your fantasy pool. Not every 5 tool player will be on your team, but at least make sure that you get 3 strong categories per player and balance them out. A guy that steals 50 bases, scores 80 runs but hits .250 with 3 HR’s and 20 RBI’s is worthless - let someone else have them. Albert Pujols is great for Slugging Percentage, but if Runs are the 5th category instead, let someone else overbid on him because he is only a 3 tool player. Historically, on average, sports athletes peak at 27 years old. Their peak doesn’t necessarily diminish for a few years - so guys that hit 27 may be a star for a few years after that. The theory is, that by the time a player hits the majors it takes a few years to adjust to big league baseball and solidify their regular place in the lineup. Around 26-27 is usually when the bigger salary arbitration dollars are up for grabs and players start to focus more on being the best baseball player they can be. Picking older players is fine, but then they have a greater chance of getting injured and usually take longer to recover from an injury. If, every year, a player hits 5 home runs over the span of a decade, then suddenly hits 25 last year, which player will show up this year? That depends on all the numbers. How many at bats has he had in previous years before his big one? Has he always been injured? Did he switch to a new team or league? These are all factors to consider before spending big on a player who had his breakout season the year before. Could it come back to bite you if he repeats his numbers and someone else owns him? - of course...but if you stick to consistent performers, you at least know what you are getting and can plan around it. In other words, better to make safe bets than take chances and gamble! Pitching is half of your fantasy baseball pool and to watch a pitcher give up long balls is painful. There are some owners that load up on the best hitters and then try to pick the best of the scraps for pitchers. We believe that it is best to research who the top 10 pitchers in baseball are, spend the money on them, instead of trying to pick up scraps. Same rules apply when it comes to categories, although it’s nearly impossible to have all five tools as a pitcher. You need to focus on the three main statistics; ERA, WHIP and Ks/9 (other leagues have different categories - so again know your rules). Wins for a pitcher is a crap shoot. There are pitchers that get 20 wins and have horrible numbers and there are pitchers that can only get 10 wins because their team always loses 1-0 or 2-1. If you can find a multiple category pitcher on a team that is expected to win 80 games then you will be fine on wins but otherwise just concentrate on the categories that the pitcher has control over. We love all San Diego Padre pitchers because they pitch like Cy Young on the mound. Make note of which parks are hitter friendly parks and which are best for pitchers. This also applies to hitters especially ones that have changed teams. Just because they can hit monster homeruns in the Colorado thin air doesn’t mean that San Diego will be kind to them all season. Hitters who switch leagues usually take a year to adjust. They don’t know the pitchers, they have new rules that can affect their playing time and in general they often perform poorly their first year. Pitchers almost have an advantage in a new league as the hitter have never seen them and in general a good pitcher always has an advantage over a good hitter. When a pitcher heads to the National league they get a chance to improve their numbers - especially strikeout pitchers who get to face a pitcher 2-3 times a game. Historically, new National League pitchers see a slight bump in numbers. In a rotisserie draft, it is easy to lose site of the team you are building. Sometimes you draft a player that you didn’t expect to get (good or bad) and this can shift the balance of what you are building in the way of category stats. If you are out of the bidding for a player, look over your team, see where your strengths are, and focus on players that will address your weaknesses. First off, you don’t want to be the guy that nominates or picks a player that was already drafted earlier. The embarrassment can scar you for life. What’s worse is forgetting that a player was taken and thinking that this player will be a steal if you get him next, only to discover that he is gone and you had other players that you could have chosen. With your list of players that you created during your research phase, you should still have a list of all the roster players so that you can quickly cross them off to avoid the issue later. By using these strategies you will at least improve your team from a perennial bottom dweller, to a top three organization in your baseball fantasy league. Your winning will come from who you pick and how well you did your homework on the best available players to draft. When doing your research, keep these strategies in mind and you will greatly improve the odds of winning your fantasy baseball pool.